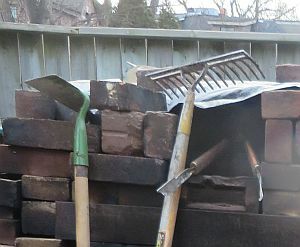 The tandoor has spent the last few winters in the garden shed at Dufferin Grove Park. 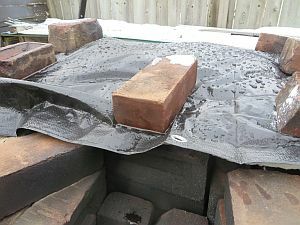 This winter it will be outside as part of the oven lab, but well protected with a tarp. Mike and Mayssan drove it here in their van and rolled it into the garage. 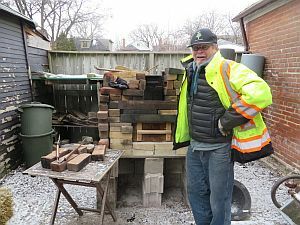 Then on the afternoon of New Year's Eve, Mike and Yo moved it out of the garage on a little suitcase dolly, pulling/pushing it through the snow -- there was still lots of snow then. 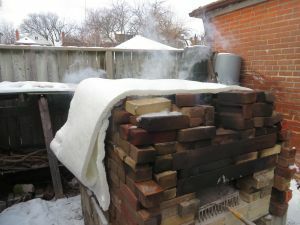 Then on Jan.3 we moved it even closer to the oven. It was easier to do by then because most of the snow was gone. Soon there will be more. Preparing for it, so that it's still possible to cook and bake with lots of snow around, will be an interesting challenge -- fun. 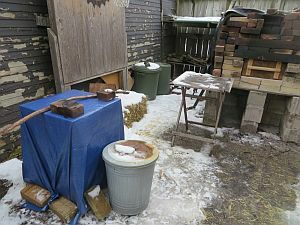 The metal bucket has holes in it -- no problem for an ash bucket. 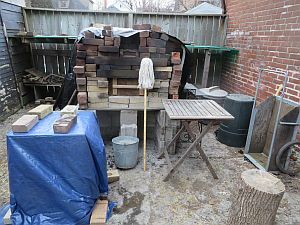 We have two steel rods for the tandoor, plus a forked stick to move wood around in the oven. 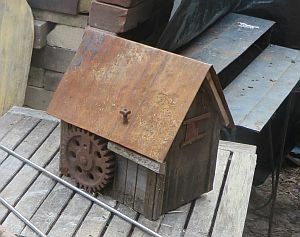 Dale Howey sometimes uses odd bits of rusting steel and barnboard to make bird houses. Two years ago, Jutta bought one from him, not for birds but to remind her of the German folk art she grew up with. Even now in a few places in the Black Forest, these miniature houses are set up by streams, and when the water runs over the tiny mill wheels, the gears inside the houses are cunningly set up to make little people come in and out of doors and hammer and saw. 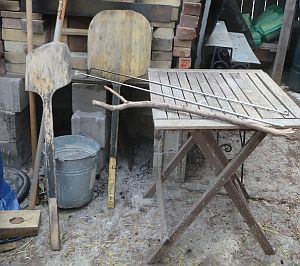 The idea is to show how work was done in the time before electricity, so there are little sawmills and flour mills and even miniature bake ovens, set up here and there in the woods with no one watching over them. Cheap art. 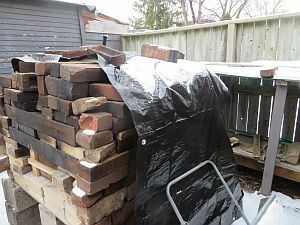 Dale's mill house is going to stay with the temporary oven and tandoor all winter. The temporary oven is also cheap art of a kind.